Saint-Pierre Toussaint was born and lived in Planton-Café, a small hamlet near Kenscoff, the well-to-do district, 1500 meters above Port-au-Prince. His career as a painter began in the summer of 1968. A summer visitor had left him his amateur painter's kit, and Saint-Pierre Toussaint started using it. 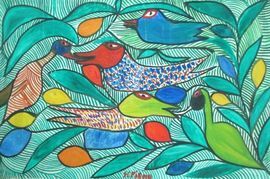 Saint Pierre Toussaint started painting only in 1972, when he watched Michele Manuel, a Haitian woman artist working in the mountains near Kenscoff. He is still a farmer, but in his free time, he paintis. Completely isolated from the art world in Port-au-Prince, St. Pierre has created a style and imagery completely his own. Toussaint can be quiet and contemplative, but he is also a lively man who likes to laugh and dance in voodoo ceremonies. Married to a hounsi, voodoo is a vital part of his everyday reality. As a farmer, he is close to nature; he understands and listens to it. His paintings are perfect translations of his personality and the facts of his existence. Toussaint's temperament comes forward in his vivid brushstroke, in the liveliness of his palette, and in surfaces completely covered with forms inspired by nature. Stylized leaves and blossoms, birds, and little bugs are his principal images. Sometimes he mixes them with symbols known to him from voodoo: the heart of Erzulie, the boat of Agoué, flags and vévé. Totally flat in design, made up of what seem to be unconnected images, Toussaint's pictures vibrate with energy. Often the forms are outlined in dark colors and filled with parallel diagonal lines holding the composition together. Sometimes the shapes are defined only by colors that contrast with the tones of the background. 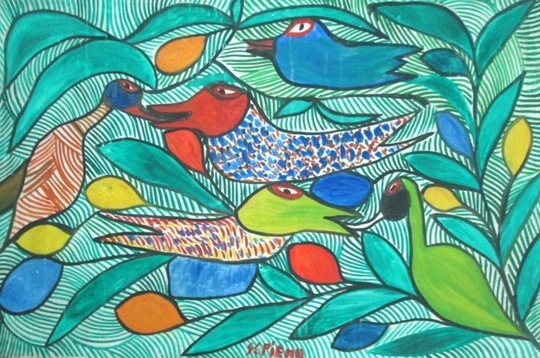 His paintings appear to be abstract mazes at first glance, yet with the help of his familiar images, one is never lost.